I love this Shirred Eggs with Spinach and Parmesan Cheese recipe for many reasons. One is it’s simple to create. The other is it’s a dish that can wow whoever it’s served to. What’s there not to like about that? 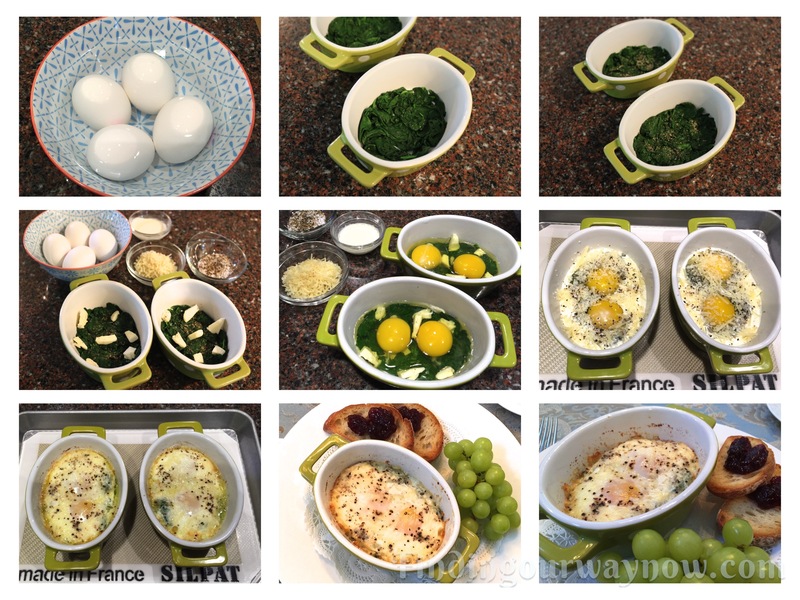 I’ve made this Shirred Eggs with Spinach and Parmesan Cheese many times with great results, both in appearance and taste. If you’re a breakfast lover and want something a bit special, this is the dish for you. All you need is a beverage of choice some fruit on the side with a few slices of toast with homemade jam, and you indeed have a very special breakfast. Preheat the oven to 350°F. Clean and de-stem the spinach. In a large saucepan with a small amount of lightly salted water, cook the spinach until it’s wilted and still bright green. Drain well and rinse with cold water. Squeeze the spinach to remove excess water. Heat 2 – 8 oz. ramekins in the oven. Add ½ tablespoon of butter to the bottom of each hot dish allowing it to melt completely. Brush the sides of the hot buttered dishes with the melted butter to coat. Divide the prepared spinach between the two heated ramekins. Evenly spread the spinach in the bottom, creating two indentations for the eggs. Sprinkle with nutmeg. 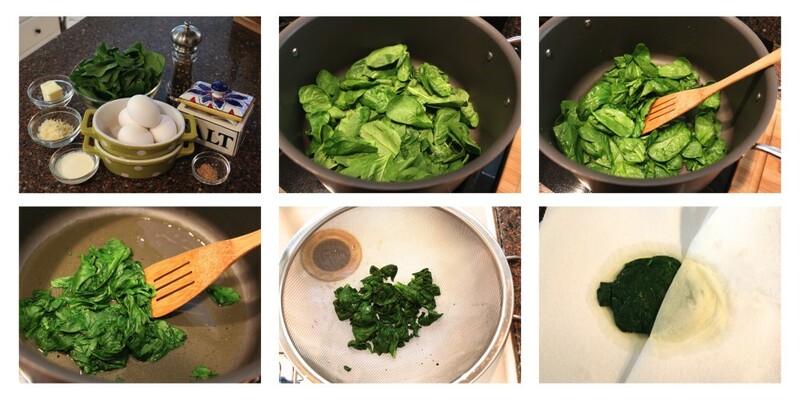 Dot the spinach in each dish with remaining butter, ½ tablespoon. Carefully break the eggs into the indentations. Season with salt and pepper. Drizzle 1 teaspoon of cream around each egg. Sprinkle with Parmesan cheese. Place the ramekins on a small baking sheet and place in the oven. Bake for 15 to 18 minutes. Occasionally check for doneness while the eggs are cooking. Add time as needed. The whites should be set with the yolks still a bit jiggly and soft in the center. Let cool for a few minutes and serve immediately. Wine Or Beverage Pairing Suggestions: Coffee and Tea are always a good choice. 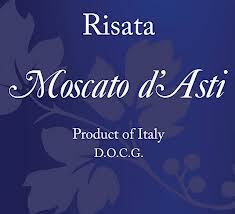 However, if you really want to wow your guests, why not add a fun sparkling wine such as Risata Moscato d’Asti or better yet make a Mimosa. Notes: The size and weight of your dish will affect the cooking time, not to worry if it takes a bit longer to cook than I say. This Shirred Eggs with Spinach recipe can certainly be doubled or tripled if needed. I’ll often place the cooked spinach between a few paper towels to aid in removing any excess water. Eggs at room temperature always work best for any recipe; this one is no exception. Cold eggs will take longer to cook, which will dry out the other ingredients. A neat trick to help bring cold eggs up to room temperature is to place your eggs in a bowl of warm water (not hot) for about 10 to 15 minutes, and you’re good to go. This recipe calls for baby spinach because they’re small, and the new growth leaves have a milder, sweeter more delicate flavor that enhances the dish. If you’re rushed for time in the morning, you can do one of two things. You can make the spinach the day before or use frozen baby spinach in place of fresh. 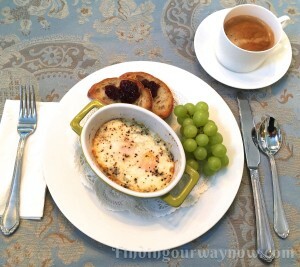 My Shirred Eggs with Spinach & Parmesan Cheese is as easy as it gets. Whenever I serve this dish, I get rave reviews, and why not, it’s such a lovely dish, with a taste to match…my kind of combination. I usually serve it with a side of fruit, good rustic bread with homemade jam, coffee or tea, or any beverage I desire. 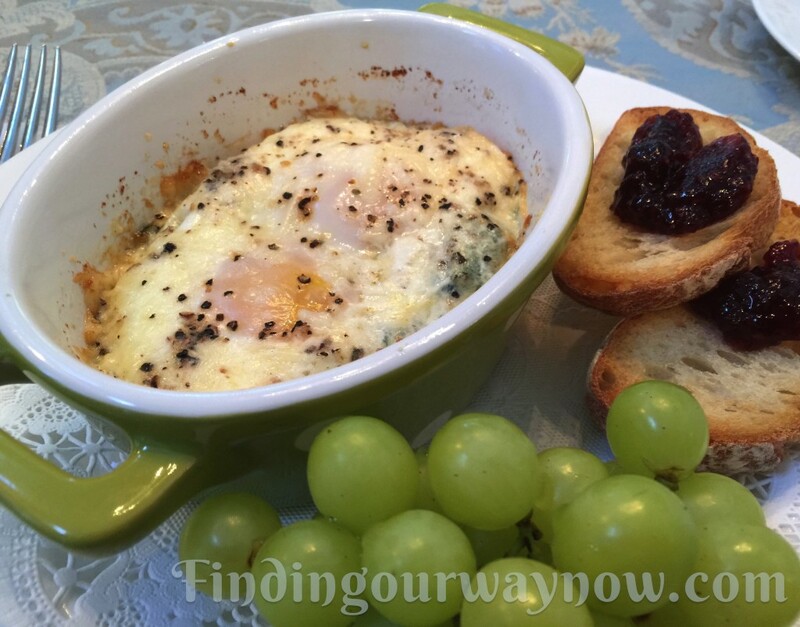 If you make this delight, why not add a sparkling wine or a Mimosa and make your breakfast or brunch extra special. 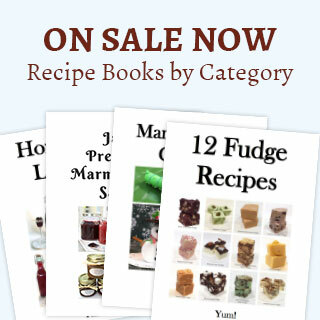 When they are this easy to make, you will never go wrong when you present these to anyone for any reason. 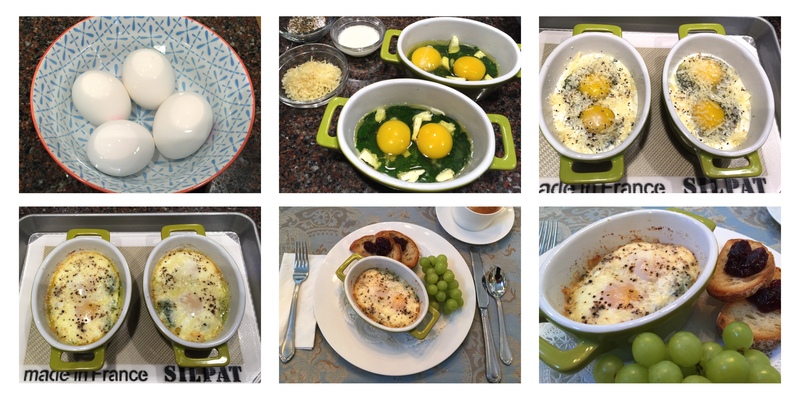 If you enjoyed my “Shirred Eggs with Spinach & Parmesan Cheese,” check out my Spinach & Feta Cheese Frittata, Poached Eggs Made Simple, and my awesome Homemade Muesli. Enjoy.